My regular Saturday market stop two weeks ago ended with my pal and one of my favorite vendors, Norma Jean of Norma Jean’s Cuisine asking me to assist her the next week by managing her table while she handled a demo nearby. So, this week I packed my bag for a 3-5 hour market trip which meant adding a gallon of water, bandanna, Florida water and my watch. Since leaving Market Umbrella in 2011, I haven’t spent more than 2 hours behind a table as a manager or a vendor; I do help my pals Rob and Susie sell their baked goods when the line backs up since I often sit behind their table with them anyway, chatting about a million subjects, so stepping up to take the money or to bag items is the least I can do. 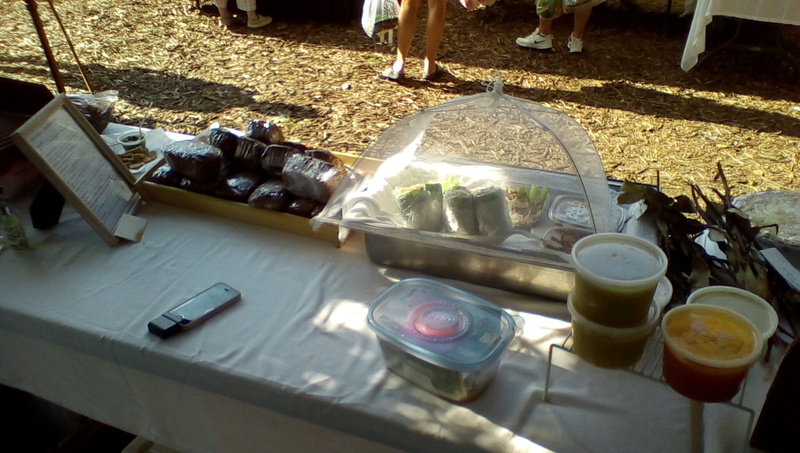 When I do consulting work with a market, I am there for a full day sometimes, but it is definitely a different vibe than managing or vending.This day, I was responsible for all of the sales at Norma’s table; no wandering off when I saw something to eat or see. Knowing the products well enough to answer questions easily and not in a rushed manner, keeping money straight, all had to be managed on my own. I think every market manager and board member should step in and run a vendor table for an hour or two. It is important to watch the traffic, gauge the body language, note the questions of visitors and to get the vibe from that point of view. 1. It’s fascinating to me how many people were thrown by not seeing Norma. The products by themselves are not always enough to signal the same vendor. I think that is a great thing- the relationships between the shoppers and the vendors are meaningful and so the person-to-person connections are as important as we assert they are. 2. The number of new people, always: I think vendors and managers forget how many people are at the market for the first time. When I sensed someone new to the market by what they asked or how they moved through the market, I would ask them if they were a regular shopper and so heard from many first-timers. It shows how a market and its vendors need must be prepared to introduce their items and the system over and over and over again and not to assume that everyone knows their stuff or about the market. 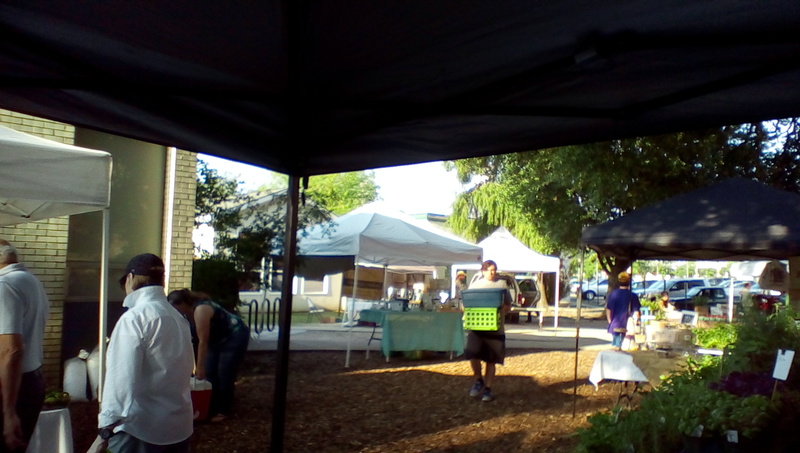 And this is a rural/suburban market and not an urban market and still has lots of newcomers. 3. Body language: Norma had left me a chair to sit in (I don’t think I’ve ever seen her sit in it actually) but I didn’t dare, having been trained at Market Umbrella that sitting at market for staff or volunteers was a no-no. It’s not that sometimes it isn’t okay; if the market is a tailgate market and right up against the table it can work (and look) well for a moment or two. However, those deep camp chairs that allow someone to sink down, I say no. But standing in place for so long was difficult for me; as a market manager, I had rarely stood in place for more than 5 minutes at a time and even had a rule to not engage in any conversation for more than 10 minutes. If needed,I would ask that person if I could call them to finish talking on Monday. Today, I found because I had to stand still so long, I had my hands on my hips regularly and so began to put them on the table or in my pockets or add busy work to stop doing it. 4. Even though many shoppers and all of the vendors know me and I am well acquainted with Norma’s products, I am even more of a true believer that employees are never going to equal with having the producer or their family standing there. The confidence in the products and the awareness of every step of the process is not at the same level. Add to that, how unlikely it is that any small feedback offered by shoppers or visitors will translate into action if it is given to an employee. Or, if slow sales of any one item is due to the lack of interest from shoppers or lack of sales technique of the employee. So even if markets allow employees to sell (which is quite necessary for most), I recommend that they add a rule that the producer has to sell at least once every month or two. 5. I love watching and being part of the barter of the market. As many of us know, many vendors barter their goods rather than exchange currency and to see the regular versions of that; Norma gets gluten-free bread for the vegan pesto samples in exchange for her items, and to be “paid” in those goods too helps remind me that we still are not measuring the true number of transactions at a market. Norma also has a barter system with one customer who has a credit slip at her booth-no one else is afforded that system, but I certainly have seen other vendors do that with some of their skilled neighbors as well. 6. How necessary it is for market staff or volunteers to roam the market regularly. So often, vendors get too busy to take a bathroom break or get change or need something and are stuck until someone happens by to assist. Lucky for me, Norma was within eyeshot as needed, and the sister managers Jan and Ann rolled by and connected with me once or twice. Checking in with your vendors can elevate the trust and raise the spirits of a market struggling in other ways. 7. When Norma finished her demo and sales earlier than expected, she cleaned up there and took over at her table, sending me on my way with warm thanks and gifts of food. As I got in my truck, I thought of how I get to finish my day there and then and not continue to sell, to then have to pack up/clean up, count the money to see if any profit has been made, and to make decisions for next week, next month etc. That long day and the added worry when the day is mediocre or bad has to be frightening and/or demoralizing to even the most confident producer. For many of our vendors, they have work for mid-week markets to start by mid-afternoon after market or the next morning or for some, to get a little rest for their other full-time job come Monday morning. My hat is off to those who believe enough in artisanal food or products to spend their life producing them for us. 8. What an enjoyable day. This is what she was demoing and selling at the other booth. 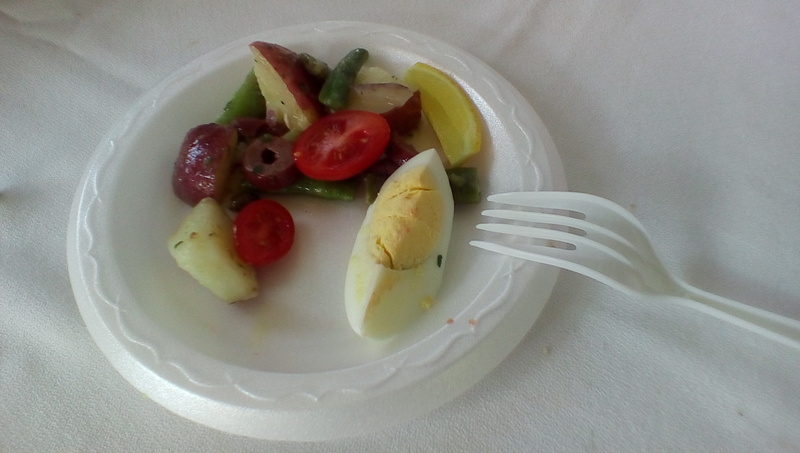 Really nice version of Salad Nicoise, without the tuna. 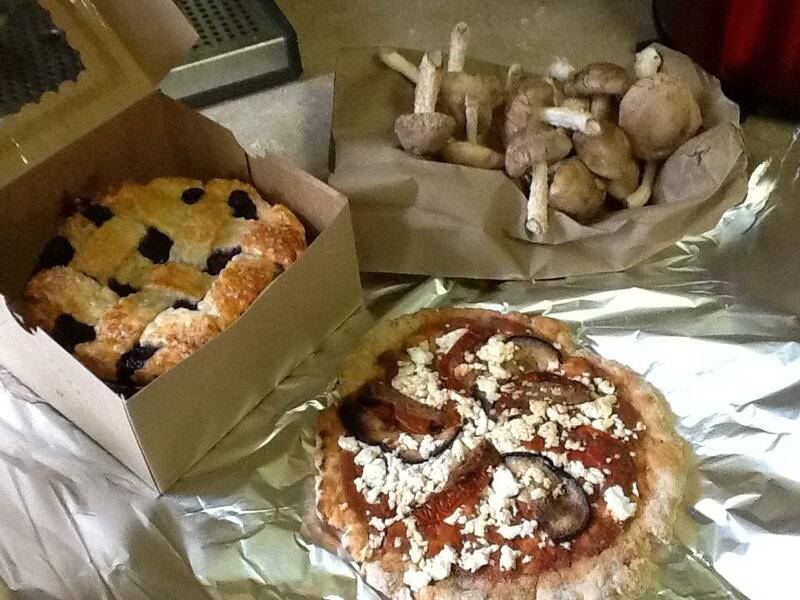 Blueberry pie from Windowsill Pies and gluten-free pizza and shrooms from the Rue family, all from Covington Farmers Market..
Take a long look at that picture. To many, it may only show another dang food picture that was posted online but to me it represents something else entirely. All of those goods came from the Covington Farmers Market, which is a parish (to most of you outside of Louisiana, parish=county) seat market located 40 miles from downtown New Orleans and across Lake Pontchartrain in an area of what used to be called the Ozone Belt for its pine tree greenery. The gluten-free pizza was sold to me by a teen who was selling them on behalf of her family business and could tell me what was in their pizzas and why, could take my money and offer change with a genuine smile and good wishes. 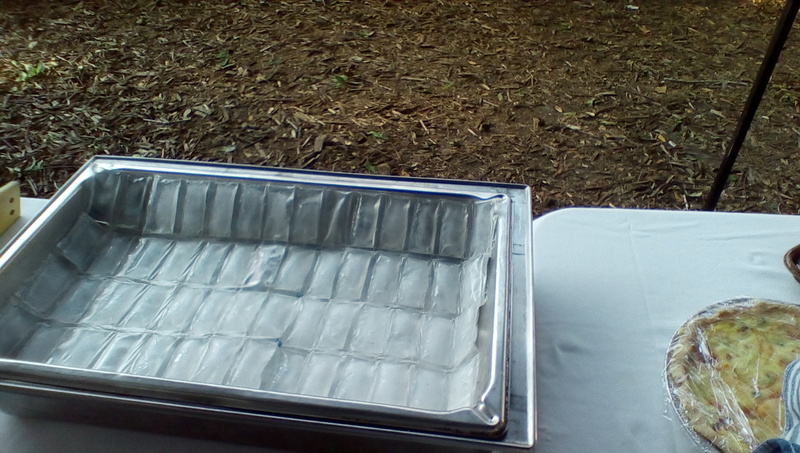 The mushrooms were on their table too and collected as a side option to their prepared food sales, as well as used in their goods. The pie was sold to me by 2 entrepreneurs that buy their ingredients locally as often as possible (literally pointing to the honey seller that provided the basis of this pie’s lack of refined sugar). This vendor’s artistic tendencies suit their product list well, all of the way to the windowed boxes for their pies and their oil cloth tablecloth and vintage aprons presentation. What is important to me as a shopper about this picture is that it represents a (still) unusual way of buying food; I can ask each of them exactly what is in their goods and how they were made. They are working to replace industrial ingredients with natural and closer-to-home versions that offer more taste. And of course, not only did I get a chance to talk directly with the makers of these goods and to encourage them further, but that I was able to buy from young women, all just beginning farmers market sales. All of the made goods were delicious and will be bought many times again. I may buy them for myself on a week in which I know I am just not going to feel like cooking or they may be used to share with friends when they come to spend the day at the pool or may even be brought to a party I am invited to as my gift. 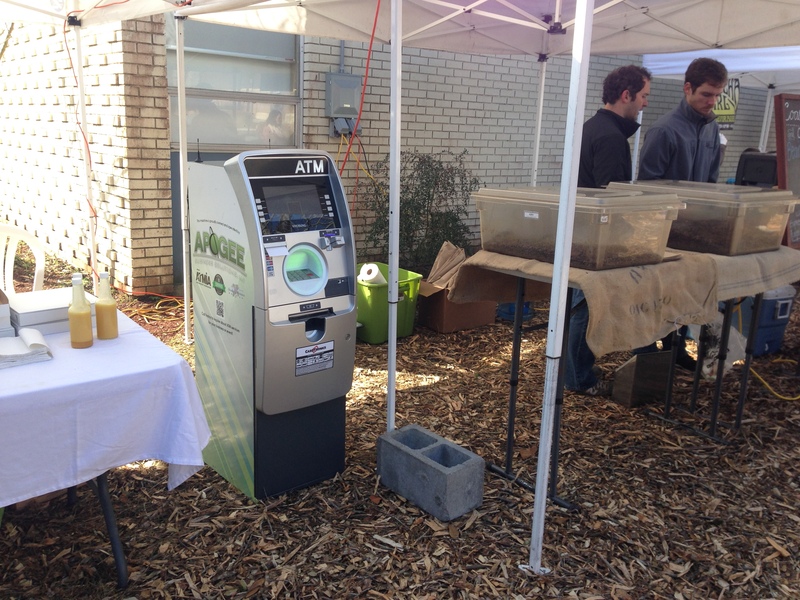 Market managers know that farmers markets are THE incubator for businesses that are not ready for or do not want storefronts. The chance to take a small idea and grow it slowly and carefully is a necessary step for any entrepreneur, yet the places one can do this are so limited that markets are among the only ones that regularly offer that opportunity. Many experienced market shoppers know that when they see new goods at markets that are advanced in their ingredients and presentation, they must immediately support them vigorously and talk them up to their friends. In turn, market managers need to monitor these vendors and introduce them to those shoppers (as this market’s manager did to me) as well as search for those vendors’ new shoppers, who may not already be present. In other words, these vendors often represent a new age in a market. Its important to remember that young vendors trying items that can only be sold at farmers markets are who we want to see more of in markets. These folks cannot (or do not) sell their goods to Whole Foods or ship them worldwide; they design products for the type of person who stops and asks about their ingredients and their process. Therefore, they are an indicator species, which is defined beautifully in the Encyclopædia Brittanica as an organism that serves as a measure of the environmental conditions that exist in a given locale. If indicator species show the health of an environment, then their low activity can alert to danger in a market’s health or when increasing, can show vitality. Encouragement of diversity of products, gender, age, ethnicity and business goals is exactly what each market must be setting as a goal daily, weekly, monthly and so on. To me, the presence of these indicator vendors and others at this little market show its emerging strength. And offers some damn tasty research at the same time. No, not THAT Tabasco. Clever market. One of my ideas for building the movement is for network leaders to think about how to alternate or expand manager trainings. For experienced managers that have attended (and maybe even presented?) at their own state conference, maybe there is way to save some of that funding for those managers to be able to go visit another market instead. There are markets operating year round in every region now and so finding the appropriate market for these managers to learn from has become much easier. For example, here in Southeastern Louisiana this early spring, we are in the middle of one of our best seasons already; strawberries, citrus, greens and generally full tables since mid January. 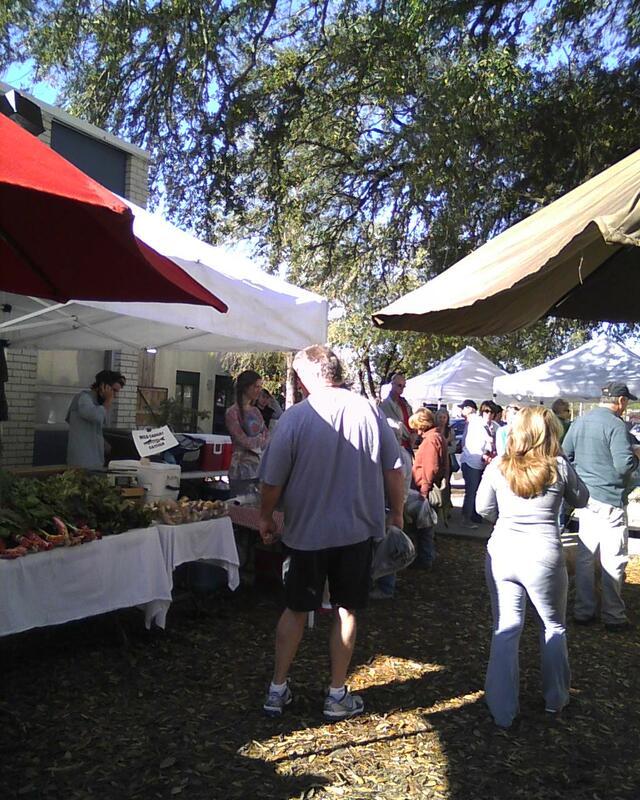 Covington Louisiana market this last weekend; 40 miles from New Orleans, this is a classic rural neighborhood-style market. 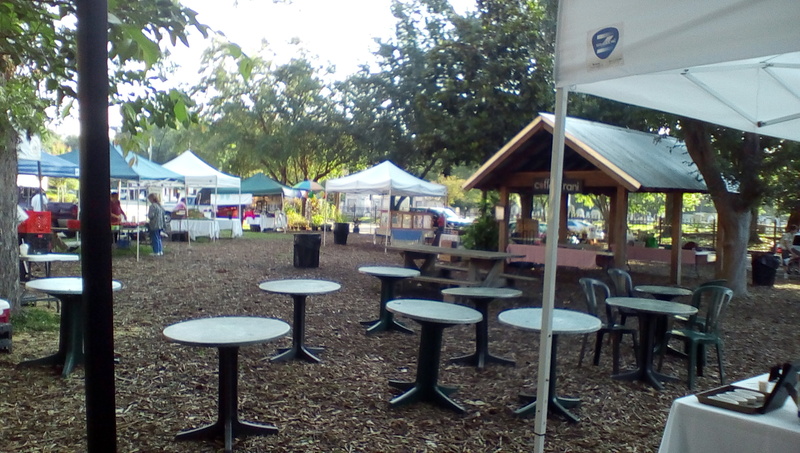 They have about 35 vendors all of which live within 30 miles of the market. 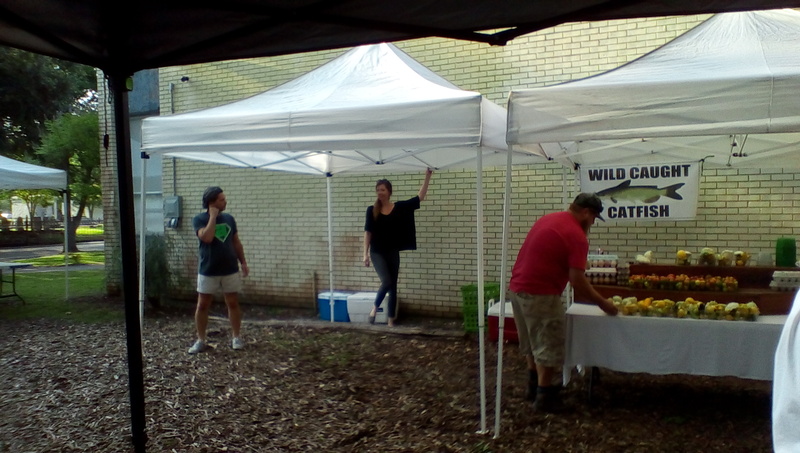 The market is held in a green space downtown in the city that is the parish (county) seat which allows plenty of parking nearby on Saturday morning; the market does almost no paid marketing and has no plans to offer credit, debit or EBT sales at all. The vendors can send their teenagers to sell or bring their toddlers because they are more comfortable with its small town air than they would be in the city. All in all, this would be a very good market to visit for a manager of a similar rural area. Covington Louisiana, 40 miles from New Orleans. 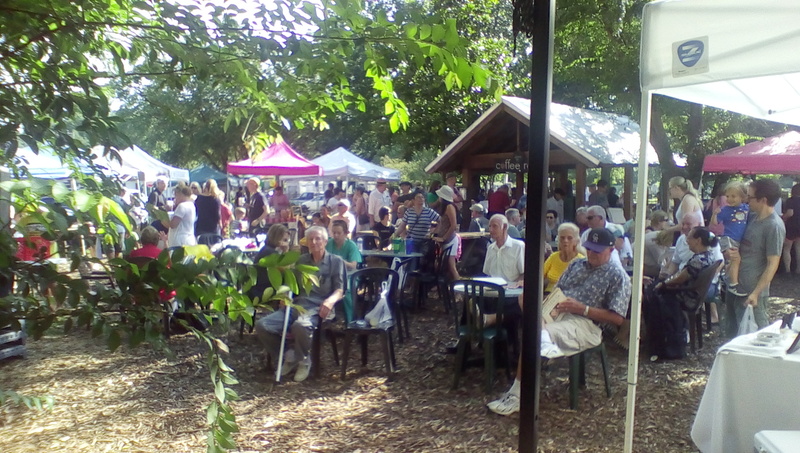 This Saturday market has thrived in recent years. 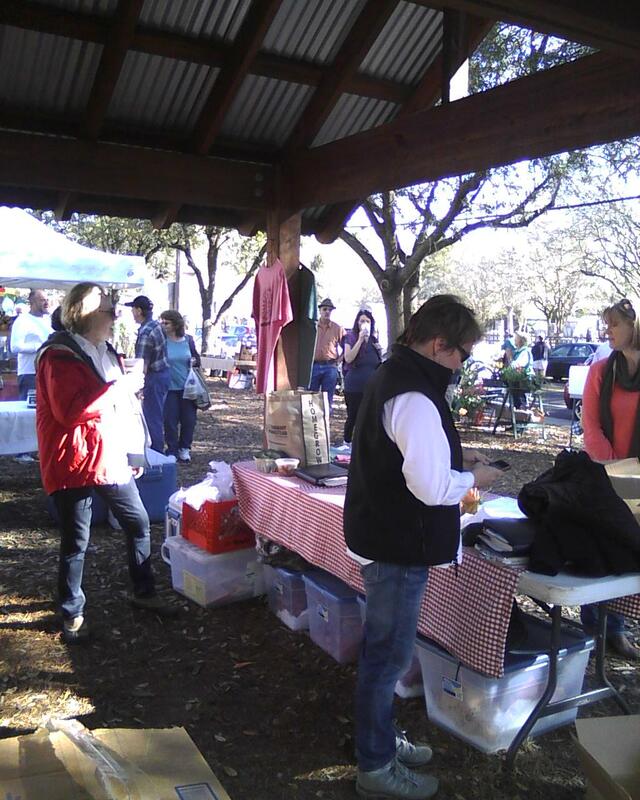 Jan (in vest) is the long time market manager and has a great attitude about her rural parish seat farmers market. Her sister Ann (in the red jacket) helps with logistics and announcements. 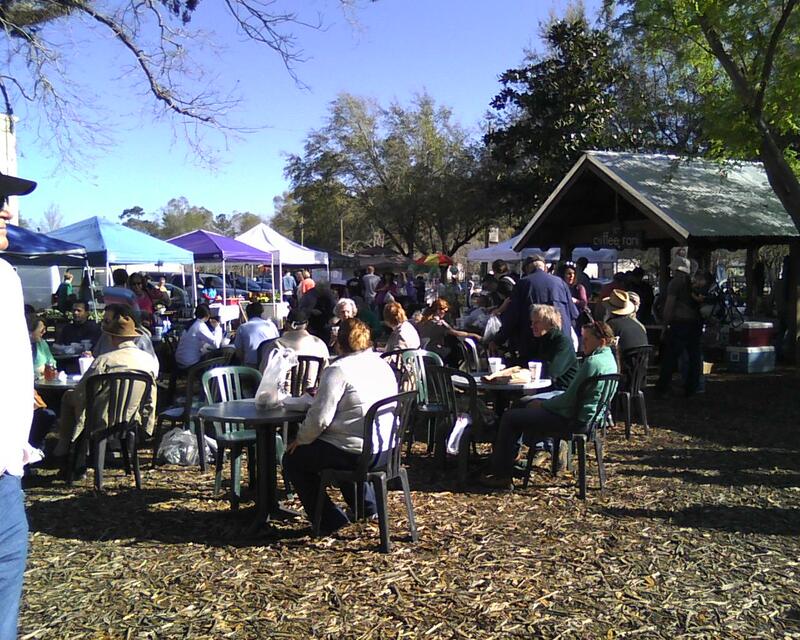 a few of the vendors at the St. Paddy’s weekend farmers market in Covington LA.